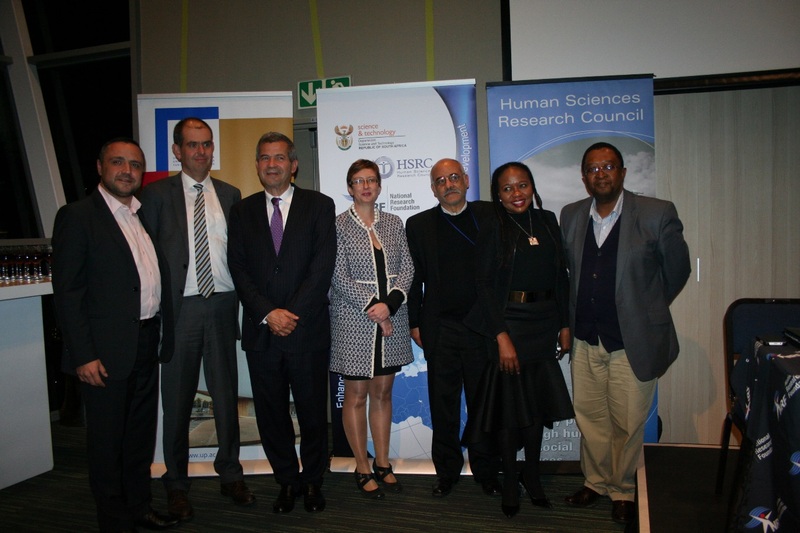 The National Research Foundation (NRF) and the Human Sciences Research Council (HSRC) held the inaugural Ambassadorial Forum on Science and Technology on 10 May 2016, hosted by the University of Pretoria. This biannual event seeks to engage ambassadors from Africa in an academic seminar to discuss and relate pertinent aspects of research and development which are aligned with the NRF and HSRC strategic focus on Africa. The engagement aims to facilitate high-level policy dialogues on research and development (R&D), and allow members of society and research institutions to debate general issues of critical importance for R&D in Africa. Strategic outcomes of the forum series are to enhance understanding of the different trajectories of development of partner countries, as well as increased and effective communication platforms with partner countries through their missions in South Africa. The keynote address was delivered by the Ambassador of Algeria, His Excellency Mr Abd-El-Naceur Belaid. Other programme participants included Prof Tinyiko Maluleke, Advisor to the Vice-Chancellor and Principal, University of Pretoria (as respondent); Dr Molapo Qhobela, CEO, NRF; Prof Crain Soudien, CEO, HSRC; Dr Shirley Motaung, Assistant Dean, Faculty of Science, Tshwane University of Technology; and Mr Daan du Toit, Deputy Director-General, Department of Science and Technology. The programme was facilitated by Prof Narnia Bohler-Muller, Executive Director Democracy, Governance and Service Delivery; Dr Aldo Stroebel, Executive Director International Relations and Cooperation, NRF and Mr Michael Nxumalo, Director Africa Cooperation, NRF. The next forum is envisaged to be hosted during November 2016.